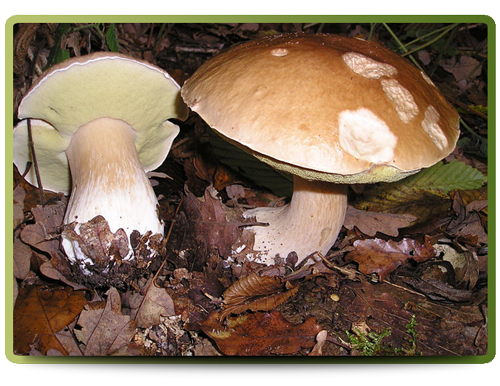 The Porcini mushroom, also known as Penny bun or Cep. As the Porcini matures it's cap can grow up to 30 centimeters in diameter. The cap is convex in shape and flattens as it matures. The reddish-brown cap darkens with age and fades to white along the cap margin. The stipe can grow from 8 to 25 centimeters tall and up to 7 centimeters in diameter. The stipe is club-shaped or bulging in the middle. 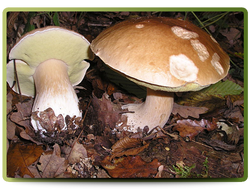 The pores on the underside of the cap are 1 to 2 centimeters deep and whitish in colour turning greenish as it matures.